Why do patients request a facelift? With the passage of time the ligaments that hold the skin of the face in position stretch and there is also a decrease in the natural fat that is present in the tissues. As a result of this the skin on the face, the brow and the neck begins to sag. Patients do not like the appearance of jowls, deep creases in the cheeks, wrinkles and bands in the neck as these are recognisable signs of ageing. This is a common reason for consultations for facelifts and neck lifts. Are there any reasons for a patient to not have a facelift? Patients who are actively smoking or on blood thinning medications are at a high risk of complications such as bleeding or wound infections and delayed wound healing. Therefore it is advisable to not consume nicotine in any form for six weeks before a facelift and to stop medication is such as aspirin or warfarin (if this is not for an essential or life-threatening condition) at the appropriate time before surgery. 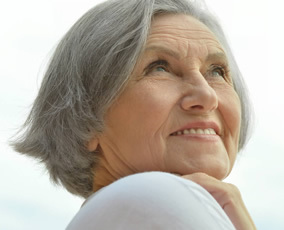 A facelift or neck lift is performed under general anaesthesia. The skin and the underlying soft tissues are usually tightened. There are many ways of doing this and your consultant will discuss with you the exact process. Usually you would spend one or two nights in hospital. Following the operation there is a large padded bandage around the neck and face along with a tube drain underneath the skin to remove any blood or fluid that may collect following surgery. The drain is normally removed the day after surgery and so is the dressing around the face and neck. Patients are usually able to shower before discharge from hospital with fresh dressings and an elasticated support for the neck and cheeks. An outpatient appointment is arranged for a few days after surgery for removal of sutures. A facelift can take from 2-4 hours to perform depending on the techniques being used. Normally you spend 1-2 nights in hospital. Before you go home all the large bandages are removed, your hair is washed and you will be fitted with am elasticated facemask to help control the swelling and bruising. An outpatient appointment is arranged for a few days after surgery for removal of sutures. The fine sutures in front of the ear are removed after 5-7 days the remainder after 10-14 days after the operation. Generally the pain after a facelift is mild but once home, further painkillers may be taken if needed, as advised by your doctor. Applying a cold compress, such as ice or a bag of frozen peas (both wrapped in a towel) can help to reduce the swelling and bruising. You should not apply ice directly to your skin as it can give you an ‘ice burn’. Vigorous activity should be avoided for four or five weeks. How long does bruising and swelling last following the operation? Bruising and swelling following surgery normally resolves within ten to fourteen days after the operation. Most patients are able to return to work and to social activities within two to three weeks of their operation. The effects of a facelift can last up to five to ten years following surgery. A facelift does not stop the process of ageing but can make the effect of the ageing process less obvious. With aesthetic surgery the outcome of the operation cannot be guaranteed and sometimes revision operations are required. What are the complications of this procedure? Bleeding and or haematoma (blood clot under the skin). Delayed healing of the wound. Scars which are visible in the early post-operative stage but which normally fade over a period of months. Sometimes the scars behind the ear can become thick and more red. These are called hypertrophic scars and can take sometime to settle down. There can also be a loss of function or injury to the branches of the facial nerve which is responsible for movements of the muscles of expression in the face. Very occasionally patients may need a small revision procedure. Depending upon the nature and extent of the procedure that you need your surgeon will discuss the potential complications with you in detail during your consultation.